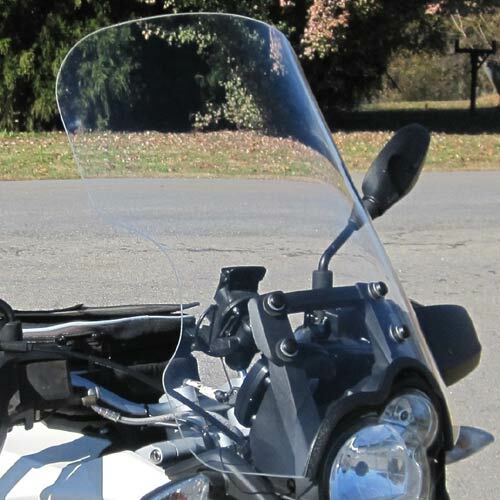 The new Parabellum Touring windshield for the 2011-present BMW G650GS transforms the bike into the perfect do-it-all motorcycle. Long trips on the highway are a breeze with increased comfort and fuel efficiency due to reduced wind drag and improved aerodynamics. Optical clarity of the 3/16 inch military aircraft grade cast-acrylic ensures riding behind the windshield off-road will not be distracting or bothersome. The Parabellum windshield mounts directly to the stock windshield mounts and is 16 inches wide at the bottom and 15 inches wide at the top. The Touring shield was designed for riders using their G650GS mainly on-road with some regular off-road adventures.